Originally named after Sardinia where they are said to have first been discovered, sardines are an oily fish that play an important role in Italian cooking. Sardines are plentiful on both coasts of Italy, so you'll see frequently on menus all year round, whether it's stuffed and baked, stirred into pasta or simply fried and eaten with bread. Aside from being delicious, sardines are also very healthy – they're extremely rich in vitamins and minerals, and a fantastic source of omega-3 fatty acids, which help to keep your cardiovascular system fit and healthy. Sardines are super versatile too – you'll often find them grilled, pan-fried, pickled and preserved in cans. 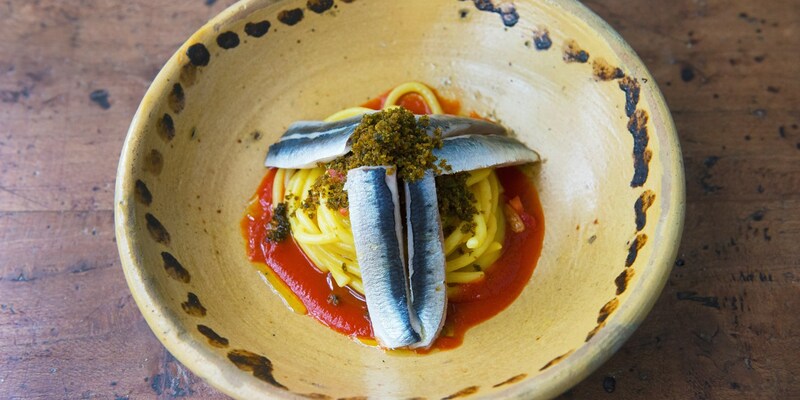 If you're looking for something easy to do with tinned sardines, try our tasty pasta con le sarde, but why not go to your fishmonger and get some fresh? Valeria Necchio's recipes below are delicious and effective ways to make the most of fresh sardines, or you can try Norbert Niederkofler's ravioli with chard and bacon foam if you want to take on something more complex!